Add to calendar 2018-10-27 13:00:00 2018-10-27 15:00:00 America/Los_Angeles Trick-or-Treat on 4th Street Trick or Treat on 4th Street!We'll be on Fourth Street in Downtown and the West End Village (from Lincoln Avenue to H Street).In Celebration of Latinx, this year’s theme is Día de los Muertos.Bring your little ones in costume for treats from participating merchants. Look for the orange poster and balloons. 1:00 p.m. – The San Francisco Young Boys Chorus (K-3rd grade) will sing 2:00 p.m. – Judging of Pet Costumes. *Registration and entry fee required, please contact Woodlands Pet Food & Treats.Bring your little ones in costume for treats from participating merchants all up and down Fourth Street, Downtown from Lincoln Avenue to the West End Village, west of E Street. *Registration and entry fee required at Woodlands Pet Food & Treats. All proceeds benefit Hopalong Animal Rescue. Woodland’s Pet Food & Treats announces our 6th annual Halloween pet costume contest & parade! Swing by with your furry friend to show off their cutest outfit & win fabulous prizes. Pet Industry professionals will be judge the event & the 3 top contestants will take home prize baskets chock full of high quality pet food, treats, & more. All participants will receive a goodie bag stuffed with awesome assorted pet stuff! Meet us at Woodland’s San Rafael location at 902 3rd St @ 1:45 p.m.on October 27th. At 2:00 p.m. We’ll line up the contestants for a parade along San Rafael’s 4th Street, which will be bustling with trick-or-treaters and others enjoying the Halloween festivities. The parade will conclude in the San Rafael City Plaza, where the judging will take place, and passerby can gather to gawk at your pups’ fantastic costumes! Hopalong Animal Rescue is a local non-profit that has saved over 24,000 animals since their founding in 1993. They provide us with the adorable kitties we host for adoption in our stores! We can’t wait to see your pet in costume, so come on in & sign up today! You won’t want to pass up a chance to score these awesome prizes! Trick or Treat on 4th Street! We’ll be on Fourth Street in Downtown and the West End Village (from Lincoln Avenue to H Street). In Celebration of Latinx, this year’s theme is Día de los Muertos. Bring your little ones in costume for treats from participating merchants. Look for the orange poster and balloons. 2:00 p.m. – Judging of Pet Costumes. *Registration and entry fee required, please contact Woodlands Pet Food & Treats. 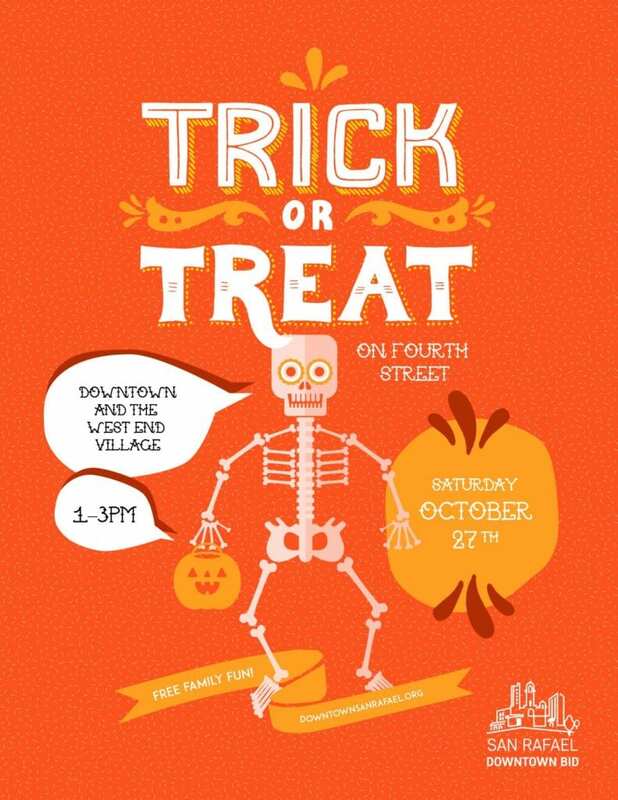 Bring your little ones in costume for treats from participating merchants all up and down Fourth Street, Downtown from Lincoln Avenue to the West End Village, west of E Street. For more information, visit the Downtown San Rafael BID’s website.